A recent satirical heading in The New Yorker “Earth endangered by new strain of fact resistant humans” reminded me of my oft stated contention that the problem with democracy is that we give everyone the vote. Don’t get me wrong. I’m not suggesting that only people who think like me, who support the same candidates I support, or the same party, should be allowed to vote. Democracy is all about not just tolerating but embracing a diversity of ideas. But what I am suggesting is that the complete lack of evidence-based decisionmaking in the democratic process means that it truly is broken, that there is indeed a strain – I prefer to call it a herd – of fact-resistant voters, who simply shortcut the decision making process by picking the candidate who shouts the loudest, has the most familiar name or just looks like a really good man. (No accident that the stats show the tallest candidate often wins – that’s what leadership looks like to the herd). It is these – the ignorant, the uninformed, the can’t be bothered – who are responsible for our broken democracy. My frustration is magnified today as the voting papers go out for our local body elections. A postal vote in itself belying the importance of this decision in Auckland, a city which is home to fully one third of our country’s population, with its infrastructure groaning under the load of rampant growth, and its ratepayers under serious financial stress as property prices and rental levels skyrocket. Faced with a certainty that we will elect a new leader – for that is what the mayor is, a leader who ‘rules’ by influence rather than decree – we must choose between a career politician (retired from a lifetime career as a Member of Parliament) and a range of business people and others, none with anywhere near the public profile of the man from the Beehive (what we call our parliament buildings), Phil Goff. Researching the candidates, one stands out for me. A business leader, who resigned her job as CEO of one of New Zealand’s biggest and fastest growing companies, a company which Forbes named last year as the world’s most innovative growth company, a company with an enterprise value of over $2billion. Vic Crone left her no-doubt high paying corporate gig to fight the good fight, based on her plan for making Auckland great, talking the fiscal-responsibility talk. Having seen the economic impact of having a successful businessman running the country, I’m personally attracted the opportunity to elect a successful businesswoman to lead our biggest city. To my frustration, the election debates that I have had have mostly been completely free of any critical assessment of the candidates’ respective abilities to get the job done, nor even clarity on what that job actually is. Phil’s credentials for Mayor are all about who he has been – an Aucklander born and bred, a long time MP, a political party leader (who was never actually elected to run the country). Those are facts. But when asked what he has achieved, what evidence there is of a direct influence on outcomes, his supporters simply say that he is a good man. I cannot argue with any of that. How does one debate what one man has been and is, with what one woman has done, managed, led and achieved? Personally, I prefer to put the fate of my city in the hands of someone who has actually run a major enterprise, with real money and real accountability to shareholders. I’m voting Vic because she understands that you can’t spend what you don’t earn, that the ability to tax the ratepayer does not present a bottomless pit of funding for pet projects, and that to spend where it is needed, the money needs to be saved elsewhere. Victoria Crone has done the sums, herself. As I see it, Auckland’s biggest problem, and its biggest opportunity, is growth. The growth is happening. Who better to lead up through it than the woman who until very recently was the leader of the world’s most innovative growth company? I’m not asking you to vote with me – I’m simply asking you to think, to read to consider the evidence – before you vote for whoever you believe, based on the evidence, will be best for Auckland. Don’t join the herd of fact-resistant humans whose motto may well be that telling statement, apparently going back to Plato “don’t confuse me with facts, my mind is made up”. I always knew that when I retired from my day job, I wanted to be a company director. I never imagined how hard that would be – after all, if governance is at least in part about strategy, and I’d made a very good living shaping strategy for my many corporate and public sector clients, why would I not be highly desirable in the governance pool? But undeterred by my obvious disadvantages – the things that I am not – I embarked on a concerted ‘networking’ effort. The director community was, I have to say, extremely generous in giving me advice and encouragement – but in reality, I am reminded of our exhortation to angel investors to just be honest with founders and say “no”, quickly and firmly. Nevertheless, in the absence of a clear ‘not in a million years’ message, I persevered. Alongside building up my interests in young companies through mentoring and investment, I discovered that the easiest directorships to get are on those early stage company boards – positions of low prestige, massive challenge, and massive opportunity to ‘make a difference’. This appealed to my values. In my business, in place of our company vision and values, there was a simple statement on the wall: “I am not just here to make a living. I am here to make a difference.” For me, helping entrepreneurial, high growth start ups succeed, is the one thing I can do to ensure that New Zealand does not become just another Pacific Island – a place where old people live, and young people visit to holiday or see their whanau. I’m here to make a difference. And so it is that I have developed a bit of a following as ‘a font of knowledge’ – note, I do not say “the font of all knowledge” – on the topic of governance for start up companies in New Zealand. With 8 ‘early stage governance’ workshops under my belt, attended by over 100 aspiring early stage directors, I guess I can lay claim to at least being in touch with the issues of governance for the early stage companies that I and my fellow “angel investors” support with what we like to call “smart money” – investment dollars that bring with them time and involvement to help the business grow faster, and spread further, and hopefully make us, and the founders, richer! New Zealand is the ultimate ‘upstart’ nation: at the top (or close to the top) of the World Bank’s list of the easiest places to start a business, to do business. My fellow ‘angels’ and I invest in some 120 start-ups a year, and with the investment comes the requirement to establish a governance board, a board of directors to guide the company to the future. This is where I have cut my governance teeth – in an environment where directors are donkey deep in the doing, where ‘noses in, fingers out’ has no meaning at all, where the primary concerns are ‘runway’ and ‘burn-rate’, and we, the directors, are standing shoulder to shoulder with the entrepreneur; believing, risking and literally sprinting from one milestone to the next. The war stories are legendary, the battle scars raw… early stage boards are not for the faint-hearted. But as I observe the dialogues in the traditional governance community, I can’t help but reflect on the palpable lack of enterprise; the investment in the established status quo; and, honestly, the lack of support for what is, in effect, the ‘sub-culture’ of directors getting down and dirty to help grow NZ Inc. While established companies generously offer internships to ‘future directors’; while the Institute of Directors offers ‘mentoring for diversity’; there is a large pool of governance talent cutting its teeth in the most challenging of environments, in companies that will ultimately make a real difference to New Zealand’s future. With minimal resources, minimal access to advice, little but their intelligence and native smarts to guide alarmingly frequent decisions based on limited information, these early stage company directors are making decisions that will ultimately shape our economic future. If we’re going to build another 10 Fonterras (and I truly hesitate to hold them up as an example of anything), start-up land is where that begins. “What about the risk?”, I hear you ask. The reality is that risk management is not about minimising risk. It is about understanding the level of risk you’re willing to take to maximise your opportunities, and nowhere is that more clearly understood than in the startup sector. Perhaps we on these start-up boards should be offering internships to more traditional, experienced directors, to experience the reality of governance life at the coalface of the future. But meanwhile, how ironic is it that the easiest entree into governance is in companies which have the biggest challenges, the least resources, little or no access to professional advice, and the least ability to pay their directors what they are worth. Nevertheless, I and my fellow start-up directors persevere, not just to keep a beady eye on our investments, but to make a difference for these companies that we believe will ultimately make a difference to New Zealand. This week my son, seen here with his older sister, turned 30. Somehow, that seems like a personal milestone not just for him, but for me; a signal that my work is done, and it’s time to move on to the next phase of my life. The ‘apron strings’ that bind us are now well and truly untied, and he was unequivocal in his advice that a surprise arrival at his 30th birthday party in New York would not be a good idea! The fact that I even thought of doing that – of arriving unannounced into the midst of his well planned weekend with his friends, full of fabulous events – made me think about just how irrational this mother-son bond actually is. I was reminded of what the wonderfully insightful Celia Lashlie said in her book about “growing gorgeous boys into good men”. Something about your son crossing a bridge, and if you, Mum, try to follow him onto the bridge, he just wants to push you off it. You need to stay off that bridge. What happens when the bridge in question is physical rather than metaphorical, and he’s actually leaving (or has left)? This week my best friend packed her own (much younger) son off to the other side of the world – and seemed to me to be at least thinking (if not behaving) irrationally. I told her that even after 8 years of living on opposite ends of the world, and despite seeing my now 30 son in person at least once a year, and sometimes more often that, I still have days when I just want to drop everything I’m doing, rush to the airport and get on the plane. How is it that after nearly a decade of living so far away, I can still feel that loss of his presence so achingly clearly? Is it hormonal, I wondered – a menopausal effect that causes mothers to lose their minds just, coincidentally, at the same time as their precious sons are leaving home? A non-causal correlation, perhaps? Or even more alarmingly, perhaps that loss of rationality is an effect of ageing – a dying off of that part of the brain that we relied on in the past to moderate our behaviour? Fortunately, in my case, I have a completely rational husband at my side, who understands that I’m not actually going crazy, even if I occasionally behave so; that those moments of longing do pass, even if they make me a basket-case for a day or two on the way through; and that if all else fails, he can always buy me a ticket to London (though it hasn’t even come to that yet). Your son has left your home, to make a home of his own. and continue feeling bereft on an occasional basis, forever. Occasional irrational thoughts (or even behaviours) do not mean you’re losing your mind. will do or say something inappropriate, irrational or just plain embarrassing. (because that’s what she actually wants you do to). Your son’s mother has not lost her marbles. She’s just being a mother. Rational arguments have no place in this situation, nor telling her to ‘get a grip’. 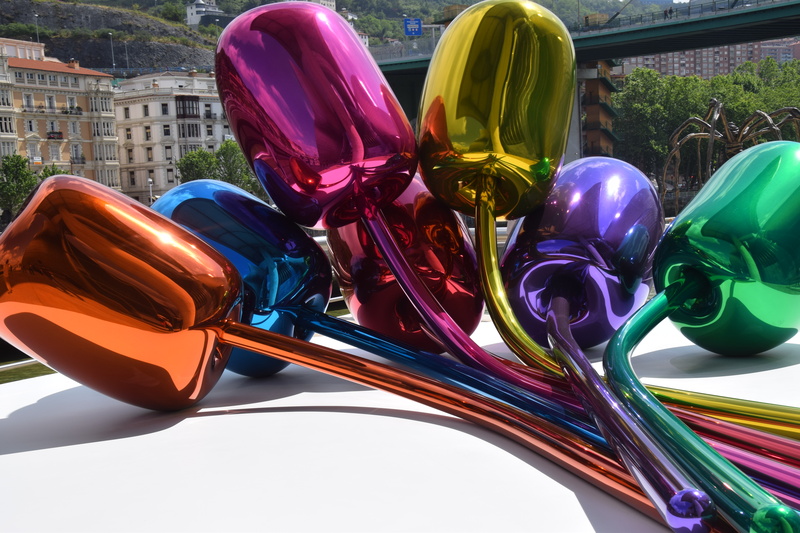 Part of the attraction of visiting San Sebastián – apart from the fabulous dinner at Mugaritz, was the opportunity to visit the Guggenheim in Bilbao. 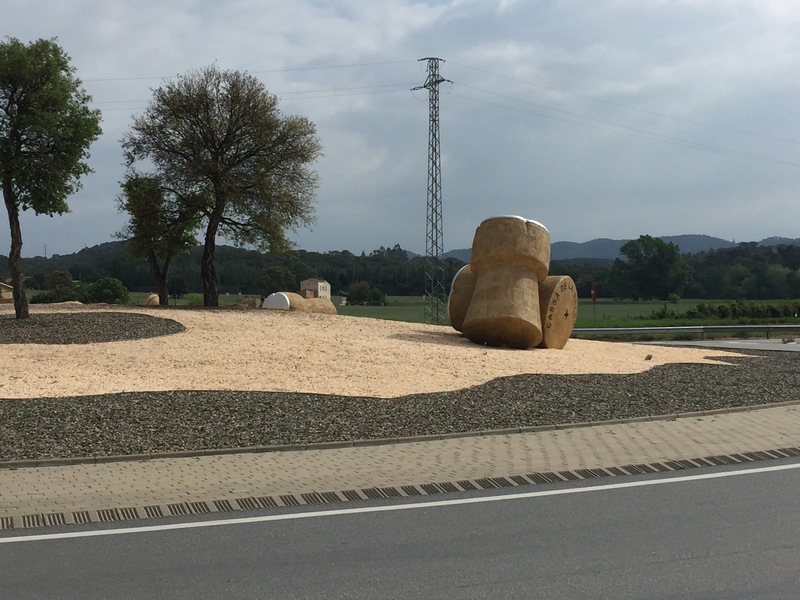 After an abortive plan to spend Monday in Bilbao – fortunately this time discovered the museum was closed on Monday BEFORE we set out for the longish drive – we rescheduled this excursion for our last day, on the way (well, sort of) back to Barcelona. Expectations were high ~ clearly too high. 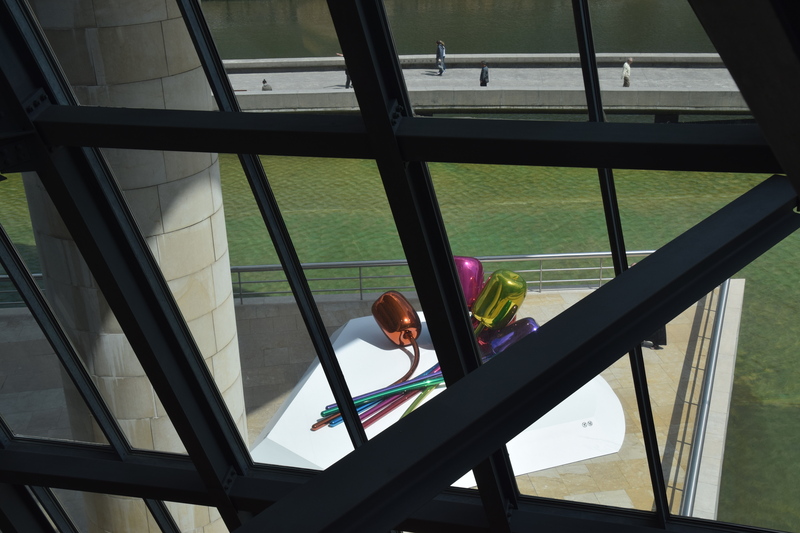 This museum of modern art has surprisingly little actual art on display, though the building itself is most definitely a work of art in its own right. 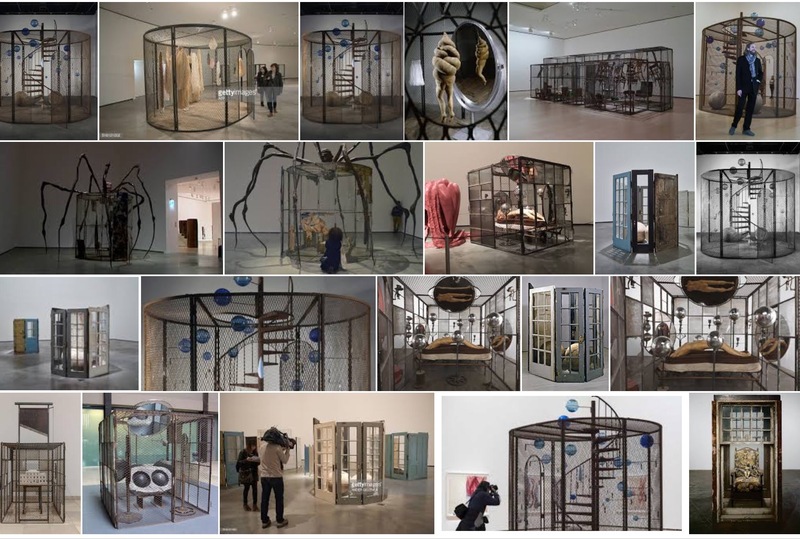 The main exhibition on display – with much breathless excitement apparent in the commentary – was room after room filled with the ‘cells’ of Louise Bourgeois – an artist who spent most of her 95 years of life re-living the terror of her childhood memories by building dozens of what are literally small rooms filled with seriously weird and warped stuff. Far far too deep and meaningful for me… Though I’m sure Dali would have approved (and probably did). 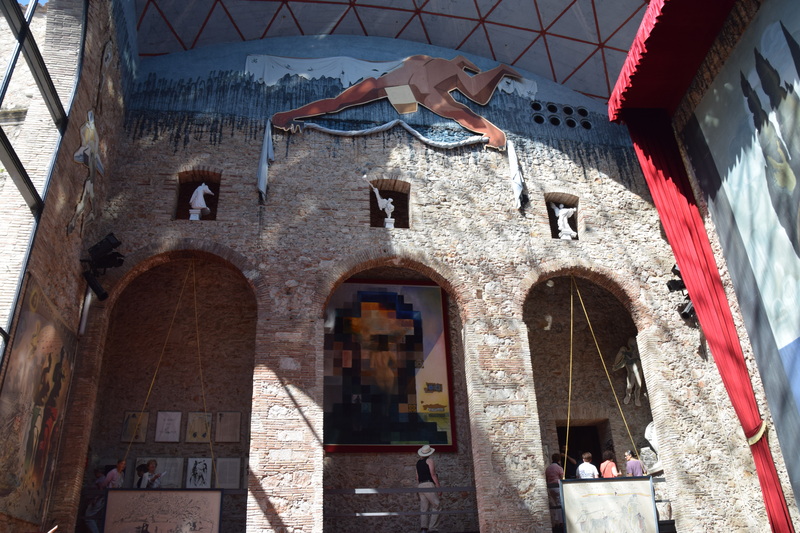 So with two truly weird art experiences under our belt, it was with some trepidation that we set off on our one afternoon in Barcelona for the Picasso Museum, the one thing we missed off our must-see list last time we were in Barcelona. And third time lucky it certainly was. This time the weird stuff – etchings bordering on offensive, though apparently there are even more offensive ones which were Norton display – was overtaken by the sheer beauty some of his other work, and what a prolific artist he was! I particularly loved his line drawings of bullfighting – not politically correct, I know, but I had to admire the visible movement that he managed to achieve with a few lines of black ink. And so our Holiday in not-Spain came to an end. We farewelled Rob, who was joining Jenna and a herd of friends for a music festival that weekend (coincidentally staying literally around the corner from our last night Barcelona hotel)! Next stop Jordan…. 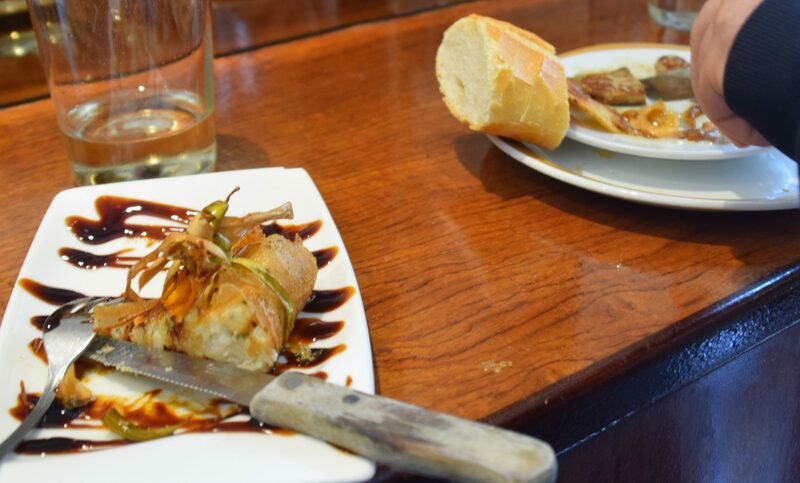 The Spain that is not Spain has many attractions; and the greatest of all is the food. Somehow, this part of the world has encouraged, nurtured and perhaps bred a level of refined culinary exploration that may be unsurpassed globally. 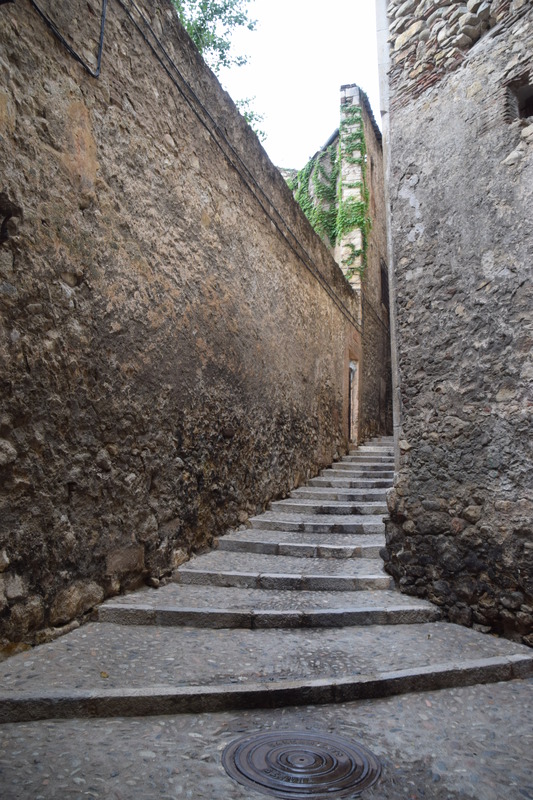 So first Girona. Amidst a plethora of tourist cafes, serving up perfectly good ham and cheese sandwiches and rolls, and moderately acceptable coffee, are many, many fabulous restaurants waiting to be discovered, if only one can stay awake long enough! Our bunch of cyclists had some difficulty falling into the Spanish habit of eating dinner at 9pm, with most actual restaurants only opening their doors at 8.30pm. 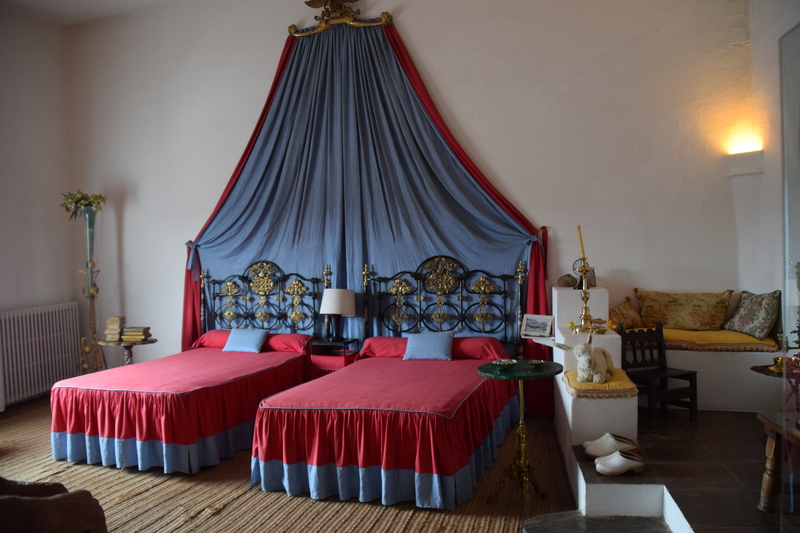 In fact, the one that took our group booking for 8 people at 8.15pm, yay, actually turned us away because they were still mopping the floors when we arrived – come back in half an hour, they said. The boys were not happy! Nevertheless we managed to have several great restaurant experiences, both with the cyclists and with Rob when he arrived for the second part of our three-part holiday. I’m not going to regale you with a blow by blow account of every meal… though the 25 course degustation at Mugaritz, with 7 extra bites at the end was surely the crowning glory – more on that at the end. 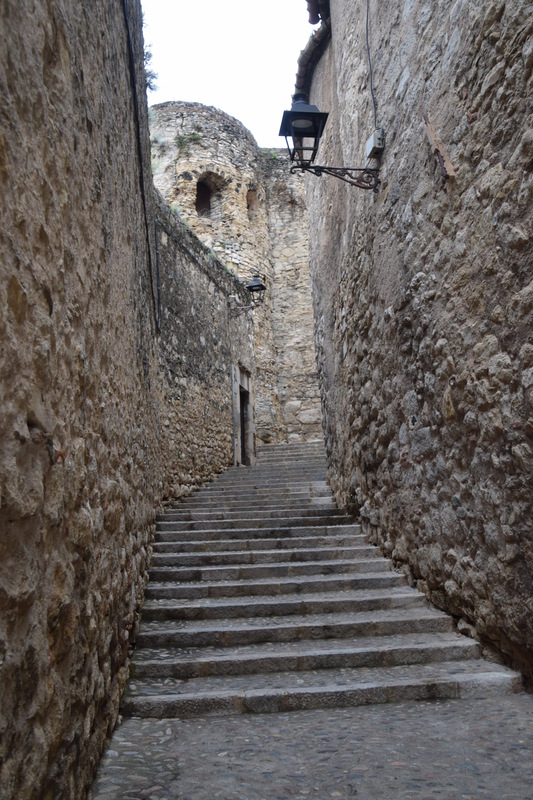 But meanwhile back in Girona, a few learnings. Lesson 2. No matter how well you think you’ve trained your staff, you can’t build a fine dining experience with people who have themselves never dined finely! A learning from our visit to L’Alqueria, currently rated the number 2 restaurant in Girona behind the acclaimed Cellar de Can Roca (with its 12 month waiting list, and the venue for our previous ‘best ever’ eating experience). This incredibly difficult to find restaurant down a little alleyway was finally found, our booking for 10 acknowledged and the first 7 of us shown to our table two floors up. But where are the 3 amigos? Turns out Don and the boys were downstairs being refused entry, while upstairs we were being roundly ignored by the two staff, who were completely flummoxed by an incomplete table. Eventually Don used his mobile phone to call down a rescue party! Next Peter orders some cava to start the meal, and asks for a bottle of red wine to be opened in anticipation… waiter rushes around apparently trying to find 10 flutes for the cava, then puts out the red wine glasses, asks Peter to taste the red and shares it out between the other 9 wine glasses – failing to top Peter’s glass up, or to pour the cava at all! And oh my, when the next bottle of red was something different… clearly he knew he was meant to bring new glasses (but no one had told him to take the old ones away). Eventually, you could barely see the table for the array of empty glassware! At which point, we formed a chain-gang, passing empty glasses along to Peter who was sitting close enough to an empty side table to arrange them there! The waiters watched us clear the table without intervening. And inexplicably, having billed themselves as a restaurant specialising in rice dishes, and indeed, with a full page of different paellas and another of risottos on the menu… Sorry, we can only do 2 rice dishes per table. Those who want rice have to agree on two of the many options, which can be served in as many portions as required. Weird! Fortunately at that point most of our table opted for something else, while Kevin, Peter and I selected two different paellas, neither if which, I have to say, were particularly spectacular. Lesson 3. 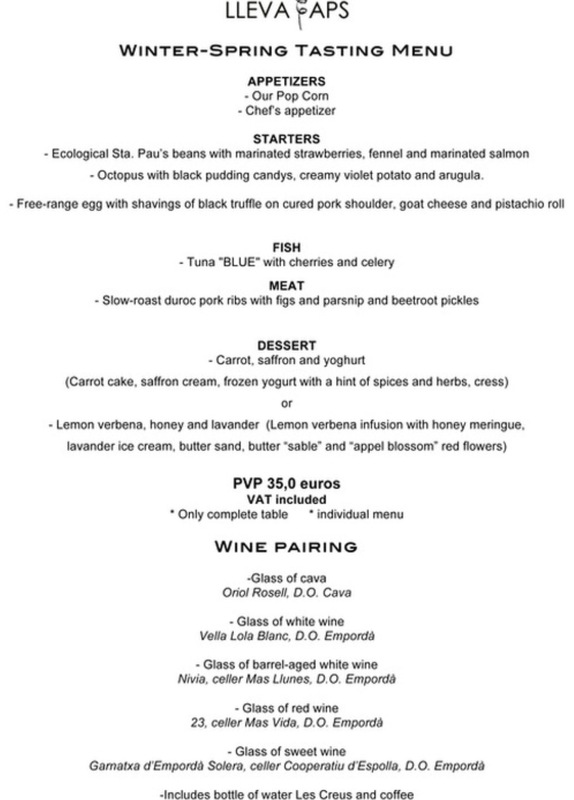 You should always make space for the degustation menu. Sorry Rob, we really should have had that menu at Nu… Don’t know what I was thinking! Thankfully the waiter persuaded us to order many dishes anyway for all to share, and it has to be said, the food was spectacular, and the service outstanding. As it turned out we did try 6 of the 11 dishes on that night’s degustation – including the interesting guacamole with lime ice cream, and the outstanding salt baked foie gras with cookies and banana ice cream. At Nu, ice cream is not (necessarily) a dessert (maybe that should be lesson 4). Highlight of the night, I think we all agreed, was the scallops, Iberian pork and ham parmentier. As I write this (sitting in Jordan) I’m tempted to head out into the hills to hunt down a wild pig! On the basis that we could only do it if everyone did it, and the alternative, guys, is to wade your way through this Spanish menu and decide for yourself what you’re goin to eat (and by the way, if we take the matched wine options, we don’t even need to worry about what we’re going to drink either). 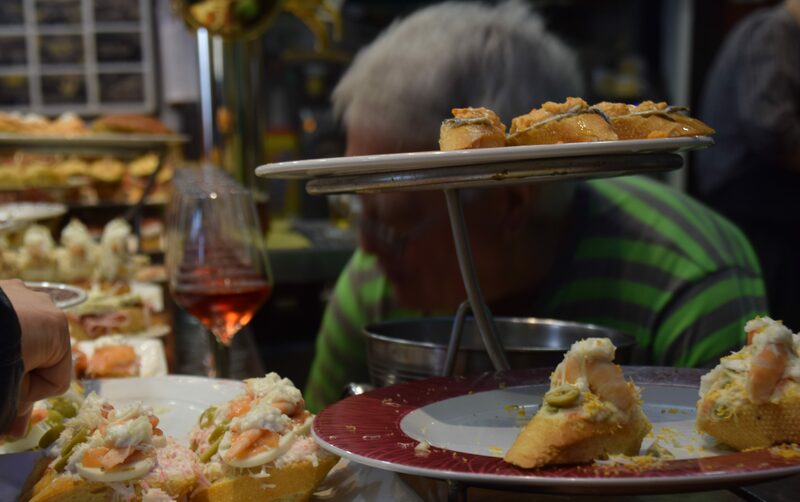 Billed as the best tapas restaurant in Girona, they did not disappoint, with amazing food and the equivalent of the “bottomless pot” when it came to the matched wines. Highlights of the 8 course meal – the octopus? the pork? the amazing lemon verbena dessert… Too hard, I’ll let you peruse the menu and decide, though for me the octopus was a revelation – giant rounds of tentacle, akin to pork fillet, perfectly cooked with a richness of flavour that trumped all else. 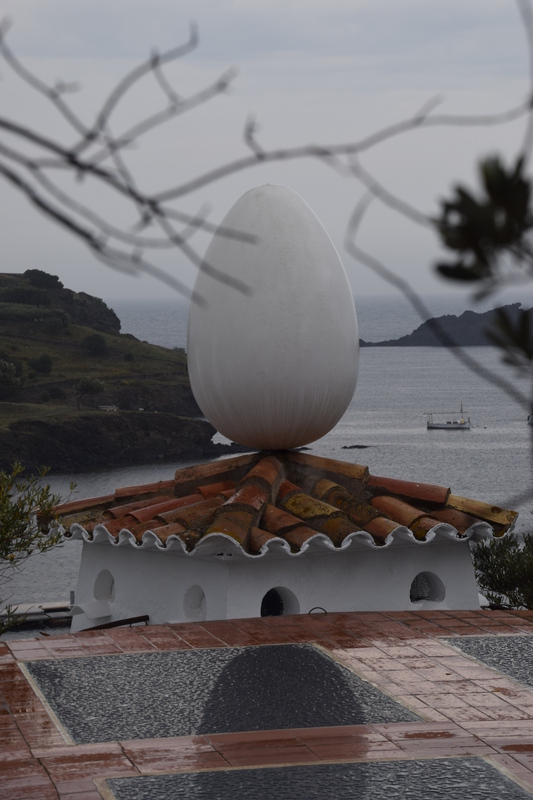 Mugaritz was, as I said, the crowing glory – the primary purpose of our 600km road trip across the top of Spain. A half-hour taxi ride up into the hills delivered us to an airy room, minimally decorated tables set with white cloths and an artfully arranged broken white plate on each. They checked (again) whether we had any food ‘issues’ … ‘Only one’, said Peter, ‘we don’t like bad food’. Unlike our last “top restaurants of the world” adventure to Osteria Francescana in Modena, which was positively snooty, Mugaritz was friendly, welcoming – ‘we want you to have fun with the food’, out waiter encouraging us to eat with our fingers – cutlery only provided when absolutely necessary. And just when we thought it was over, the tower of the seven deadly sins arrived on the table. Taking off the first lid, we found pride – three hollow shells of gold plated chocolate, followed by envy – one choc only, leaving the rest envious, and so it continued. 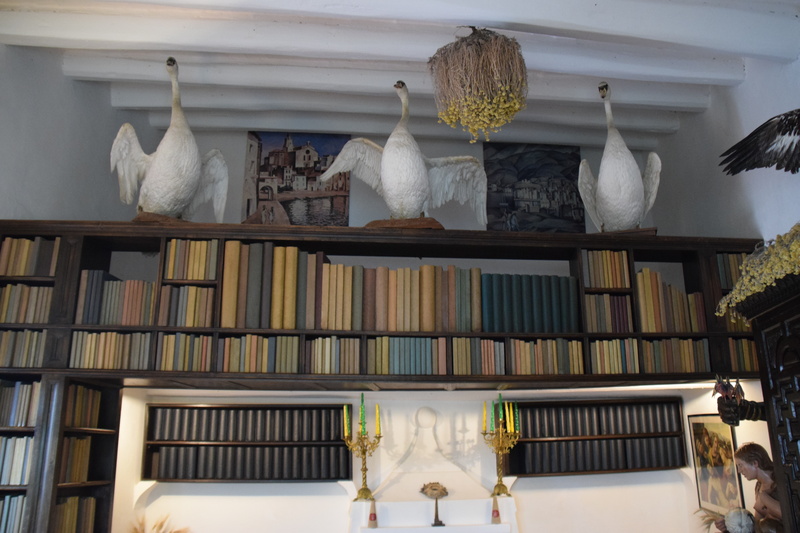 It was also fascinating to watch the other tables having not quite the same things – perhaps they had specified food foibles – and to visit the kitchen to see the lists for each table being efficiently crossed off as courses were delivered one by one. A truly extravagant indulgence, a real foodie experience, and yes, we definitely had fun! Even the slightly hair raising ride back down to the coast in a taxi with limited braking function was part of the adventure! A week later, as I faced yet another blander than bland meal of “Jordanian specialty”, I thought it was probably just as well that we ended our holiday with lots of exercise and less tempting food. After all, life’s all about balance – and I can’t wait to start experimenting with more not-Spanish flavours when we get home! You’re not in Spain now! What has been billed in my mind throughout the planning process as “our trip to Spain” turns out to not have been to Spain at all. While not overt, it was clear in our first two weeks in Catalonia that this is a region, and a people, in the midst of a ‘self-determination’ debate. The Catalonian flag of independence flew from every other balcony, though interestingly, not always in exactly the same colour. Our questions about the differences between the red star vs the blue starred ones were mostly met with shrugs – reminiscent of that inimitable French shrug with which I am so familiar. The anti-independence cafe owner we asked about it, somewhat disparagingly explained that the ‘official’ flag of Catalonia is the striped red and yellow one – apparently created by a French general at some stage in the past when the Catalonyan armies came to his rescue, and lost their leader in the process. 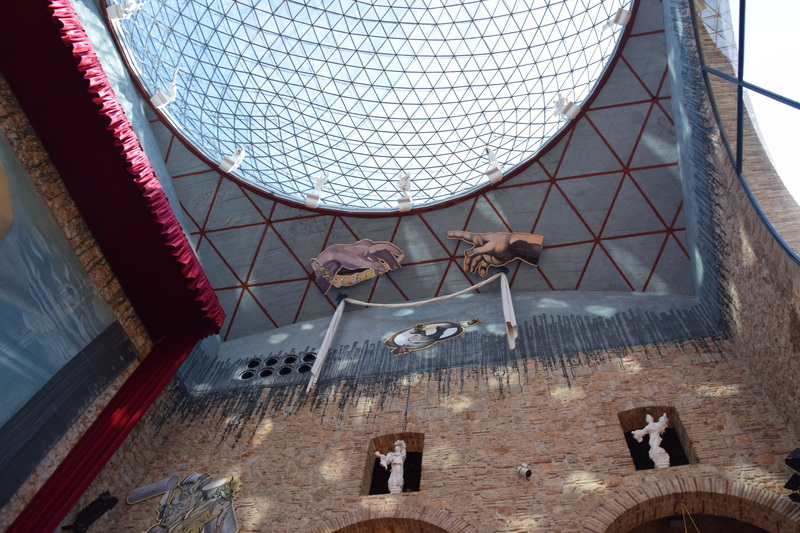 It is said he dipped his fingers in the Catalonyan blood and drew the four red stripes across a golden shield. This is the official flag of Catalonia, a province of Spain. But in a quite recent unauthorised referendum, supported by the provincial politicians, but not endorsed by the Spanish government, the population apparently voted to secede… with the forces for independence apparently agreeing on their new flag construct – a triangle with a star superimposed on the stripes, but not on its colour. All this reminding me of the ridiculous flag referendum in NZ where two of the choices were simply different colours of the same design, which split the vote, and arguably resulted in the old flag being retained for now. 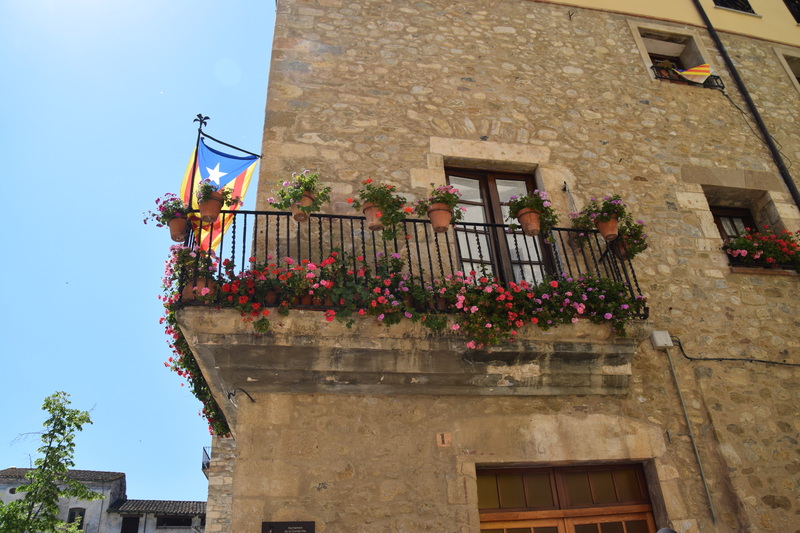 So Catalonia remains very much part of Spain for now – apparently, according to a tour guide we spoke to, having rejected the halfway house of devolved government in a semi-federal arrangement as has been implemented in other northern provinces. The Catalonian language is visible in the bilingual signage, and I guess audible for those with an ear for these things. But it was, as I said, not overt… maybe there are so many tourists from the rest of Spain that it’s all blending in…. In contrast, heading west through the Pyrenees to Basque Country, the divide became much clearer. Bilingual street signs gave way to separate signs – sometimes one on each side of the road, leading to massive confusion for map readers… and reflecting what we discovered to be an aggressively separate-from-Spain people and culture. Human remains discovered recently date the Basque people to being in the region more than 5000 years ago, with evidence of their seafaring forebears having reached the ‘new world’ across the Atlantic, along with the Vikings, centuries before Columbus. 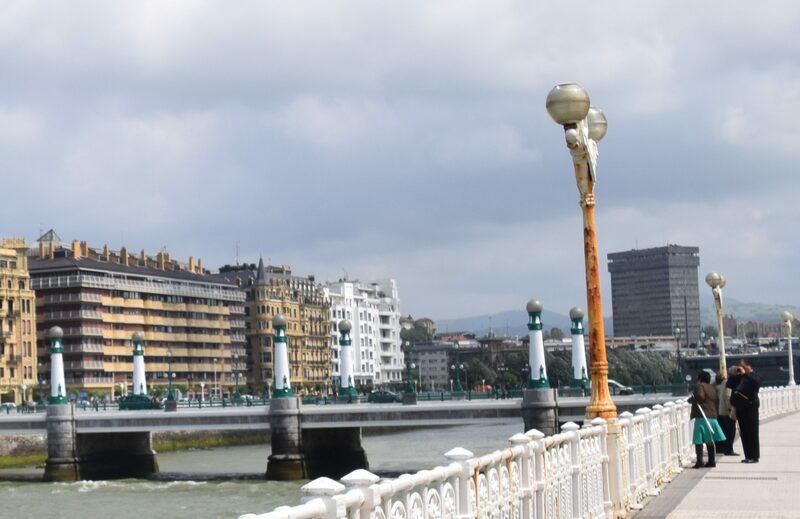 In San Sebastián, the language of choice is Uscera, a language completely unrecognisable from Spanish, since it predates Latin. With roots apparently in Ethiopia, it is one of the oldest languages still in use on the planet (though Rob informs me, courtesy of Dr Google, that the actual oldest language in Europe is actually Lithuanian). In the Basque region, schools use Usecera as the mother-tongue. As the kids get to 7 or 8 years, we were told, they start doing one day a week in English. Eventually Spanish is introduced, but only for a couple of hours a week. An interesting message, there. We did a fascinating tour with a retired US serviceman, married into a Basque family. A couple of hours trawling an edited history of the region, including the impact of Franco – most visible in the one ugly building blotting the skyline… Looks like a prison, said one of our fellow tourists, mirroring my thought that it looked like John Foster Square (police HQ) in Johannesburg! But no, apparently it’s residential – “just like Soviet Russia” said another. 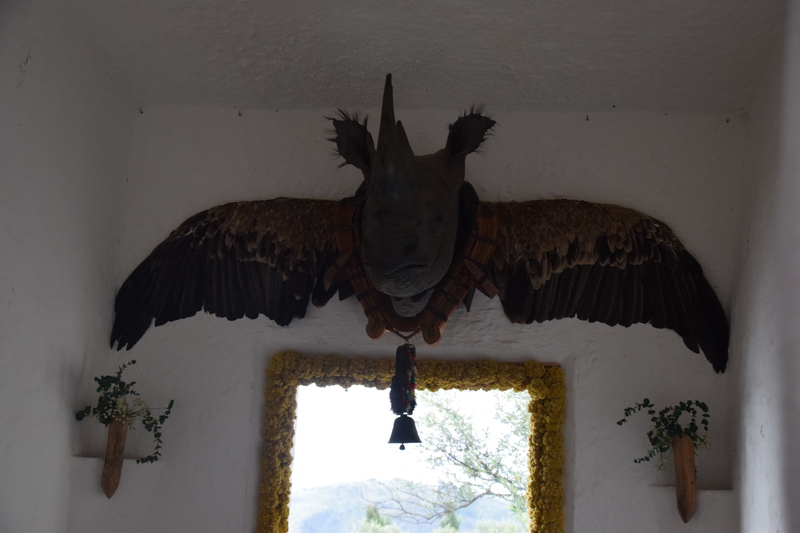 Keith, our guide, regaled us with tales of the past and the present… Franco, he said, was on a mission to “make Spain great again”. I really wanted to ask if, as a US citizen, he was concerned about the parallels with Trump’s rhetoric, but in the interests of group harmony, I refrained (out fellow groupees being “official barbecue judges” from Kentucky – I kid you not!). He talked about ETA, and the parallels with the IRA … I wondered if Keith himself might be what is euphemistically called a “government employee”? This tour guide gig would be the perfect cover, and he talked at length about doing drug-enforcement duties in South America… Another thought I kept to myself. According to Keith, and indeed similar to what our grumpy Girona cafe owner had said, a lot of the tension is economic. Here in the north, people work (well, not that hard – see later comments) but they do work. The people in the south are lazy (or appear to be, it’s often 40 degrees in the shade after all) and the money from the north goes to fund the less-productive (shall we say) people in the south. Mind you, Keith did go on to explain that the average working person doesn’t actually work all that much either. Explaining how pintxos (Basque tapas) works, and how to eat like a local, he told us that a typical working day starts at 10am (after you’ve walked the dog – everyone seems to have a dog, despite living in tiny apartments – had your swim in the sea, and picked up a coffee and a pastry, to get you through till morning tea time, at about 11.45am, when you pop out for your first pintxos and a glass of wine or cider. Then it’s back to work for an hour or two, while you make plans to meet your friends for lunch. Around 1.45pm you might meet some friends in a pintxos bar, for one or two drinks and bites to eat in anticipation of your menu of the day, three course lunch which starts around 2pm, with half a bottle of wine per person included (though it has to be said, if you are a real wine drinker, you will want to select – and pay for – your wine separately rather than drink the Ribena-like stuff included in the menu price!). Around 4pm you will return to work until about 8pm – this is when any ‘real’ work gets done, though one has to wonder about the possibility of doing your best work on what could easily by now be your first bottle of wine for the day! And that also explains why restaurants don’t open until 8.30pm in the main… People are at work! If one is to believe Keith, most people don’t take work all the seriously anyway – they’re just working to get through to the retirement cheque, when they can spend their days at the beach or the park, eating and drinking on the government. The fact that these cheques come from Madrid – central government – is a significant deterrent to the population voting to completely break away from Spain. 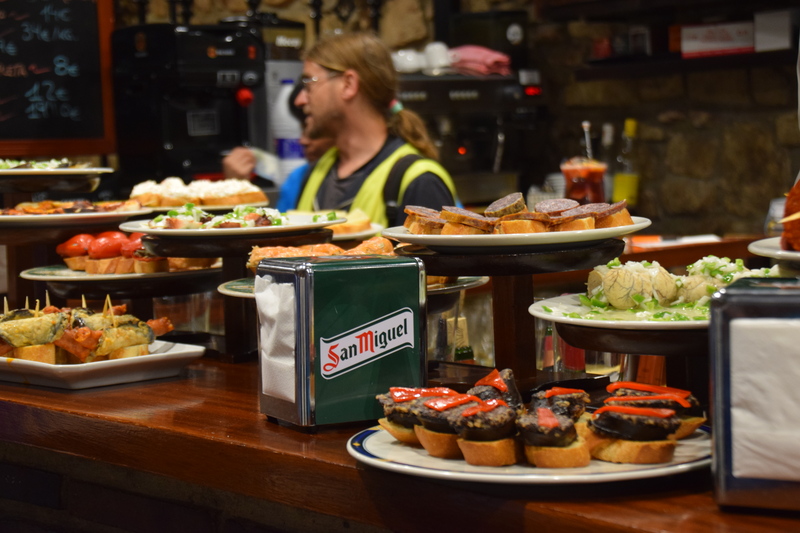 The second part of what turned out to be a nearly 6 hour tour was basically a pub crawl – visiting 5 different traditional pintxos bars, for a carefully well-matched drink and “snack” at each… foodie heaven! Showing us how to eat like a local – claim your ‘real estate’ when you walk in (a patch of counter or bar space – these are stand-up eating experiences); don’t take a plate or cutlery (unless what you’re eating really needs it), especially don’t treat the array of food like a buffet! We quickly started ‘judging’ people with a large plate, loading up, as being seriously culturally unaware! Lean forward and bite… The lean needs to be far enough that any drips fall on the floor, not your front – and then drop your toothpick and napkin on the floor to follow. Don’t have more than one, or maybe two if you must, at any place before moving on to the next. 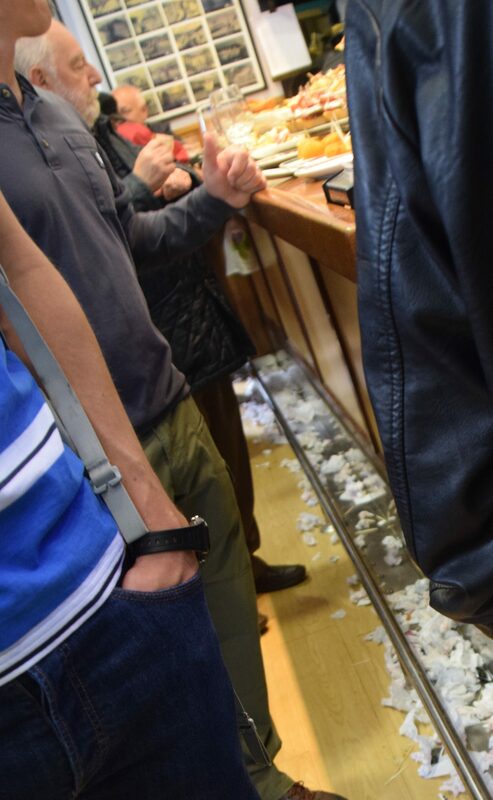 You can tell where the locals eat – the floor is covered in napkins and debris, and the place is empty by about 2.30pm when they head onwards to their real lunch. Apparently on the weekend, the process repeats – only at a much more leisurely pace, and in much larger groups, as whole families roam the streets grazing on this and that before somehow miraculously agreeing on where to lunch. Keith talked about his Basque family of maybe 15 or 16 people visiting 3 or 4 pintxos bars on the way to lunch… Kids, oldies all in tow! 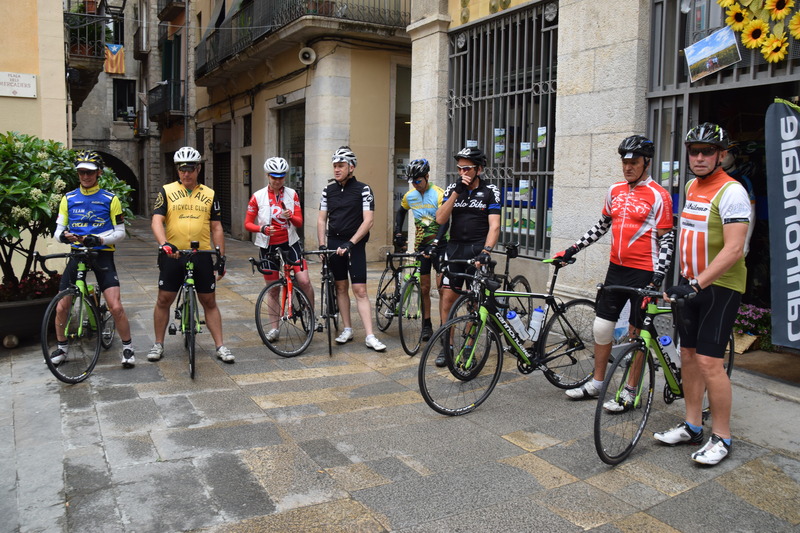 Having experienced first hand the difficulty of getting a small group of cyclists to agree where to eat, I marvelled at the fact that 16 people could visit not one, but 4 or 5 bars and restaurants in a single day, and apparently all hang together doing so. They then stay out -kids and all – often until the early hours of the morning, socialising, snacking… ‘Back home’, said Keith, ‘I’d get a visit from child protection services’, but here the kids are included in everything. Especially, it seems, the eating and drinking that is so very much part of this amazing part of the world. 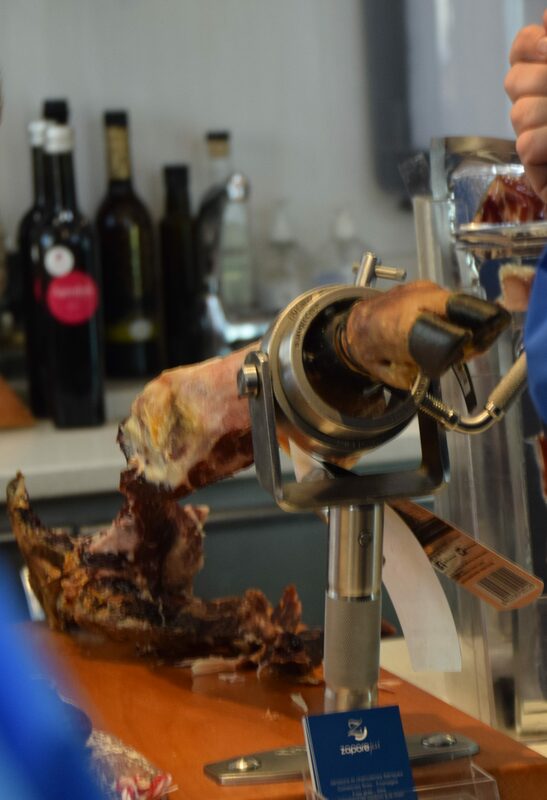 If there is a single item of food that I wish I could smuggle back home, it would be a large hind leg ham of black-hoofed Iberian pig – a taste beyond description, sold on the streets as a paper cone filled with ham slices – heaven! Instead, I’m bringing back a pintxos recipe book, planning that pintxos party in the not too distant future. And determined to henceforth refer to this holiday as the one when we were not in Spain! I am not an art critic. I have no ‘art’ credentials, some might say no taste either! 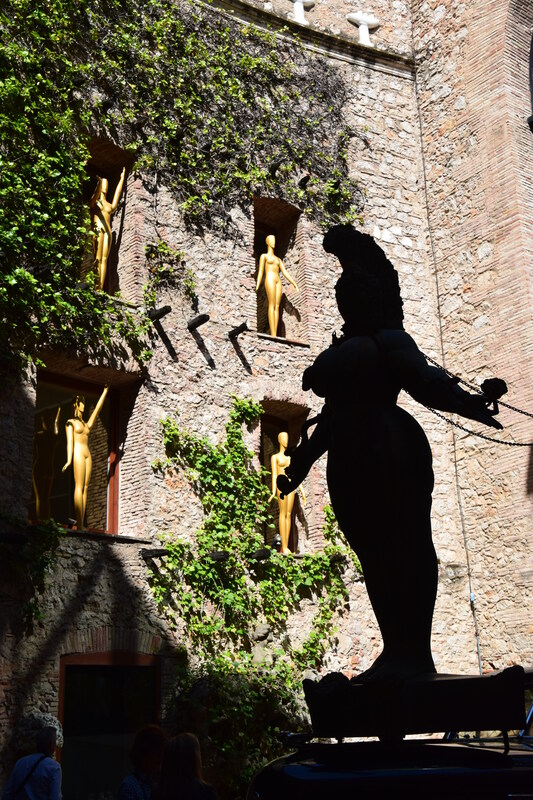 So a tour of the life and works of Salvidor Dali – visiting both his home in Port Lligat and his Theatre Museum in Figueres, was more perplexing than perhaps it might have been. 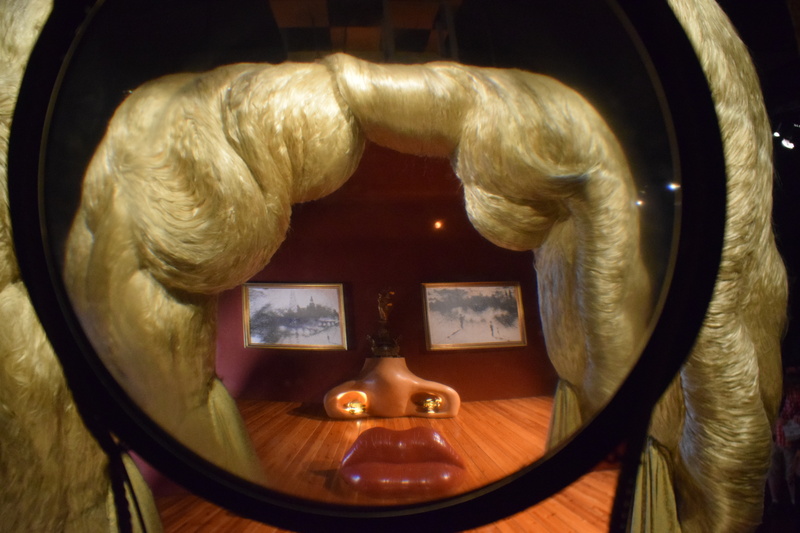 Of course, I have come across Dali before – his red lips sofa, his melting clock, his obsession with eggs and of course his ubiquitous moustache. 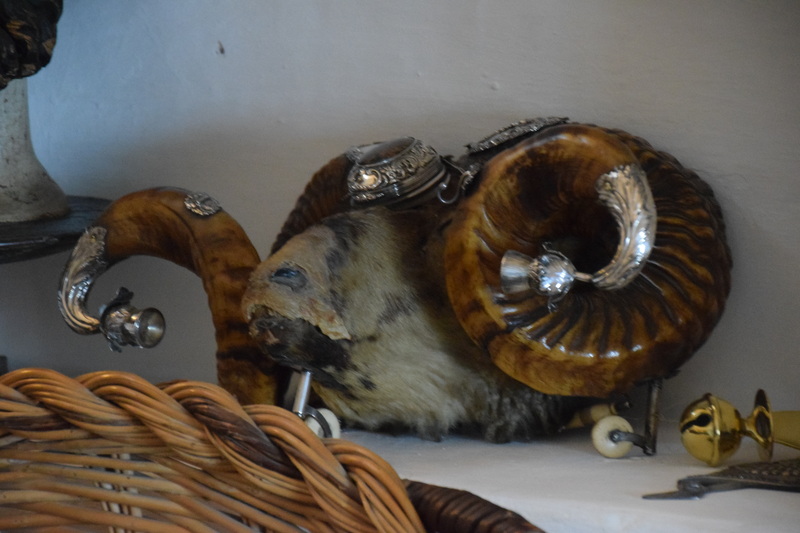 What I hadn’t appreciated was his obsession with stuffed animals – from the 3 swans that he used to feed on the beach, which on death were stuffed and displayed in his library, to the grotesque rhinoceros head set amid giant eagle wings, to the two kid goats in his bedroom and the jewellery adorned polar bear in his entrance hall…. I knew immediately this was a man I simply could not like! The house would, in other circumstances (ie. with different less famous owners) have been condemned as a monument to knock-knackery in particularly bad taste. Instead, people take what is a tortuously slow and windy drive on an unreasonably busy road to visit the house where tickets must be booked and paid for in advance, and collected no less than 20 minutes before your appointed tour time. Each tour – at 20 minute intervals – is limited to just 8 people. The ticketing system means that each group has to hang about in a place where there is nothing else to do, and precious little shelter from the rain that started falling on our arrival. Perhaps I was not in the best state of mind to appreciate the brilliance of what for me was simply weird. 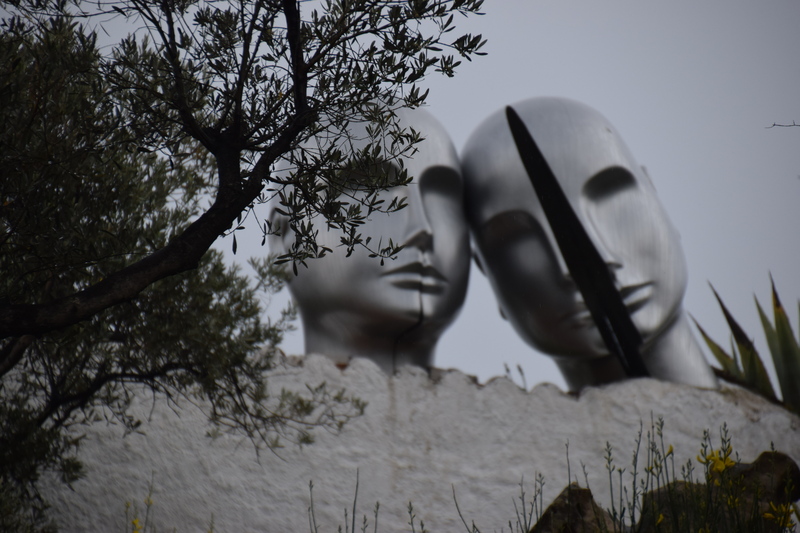 It felt like Dali had increasing been playing out a huge practical joke on his adoring public, pausing the boundaries of what they would accept as art simply because it had his name on it. 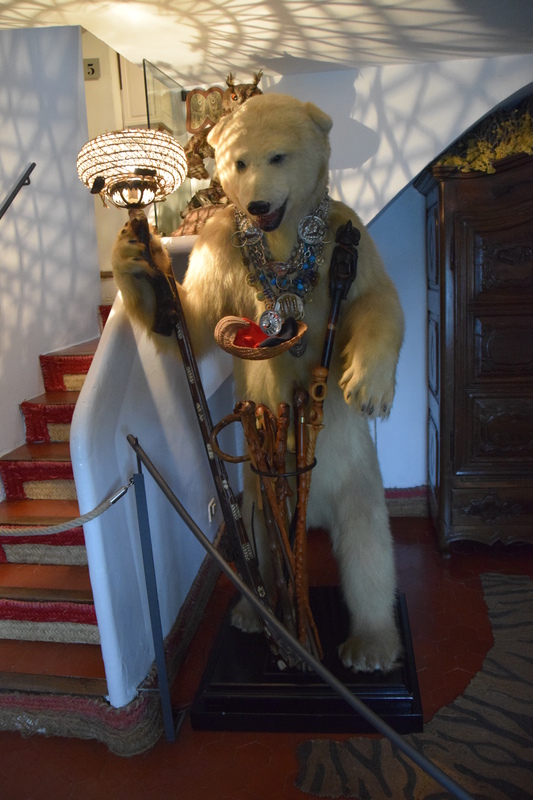 If not for the taxidermy, I might have shown more sympathetic interest in how this weirdness came about. What sort of childhood did he have, why did he love flies so much he would honey the ends of his moustache to attract them? And why did he love the sound of crickets – so much that had a Lille cage of crickets embedded in his bedroom wall? But I really did care enough to find out. 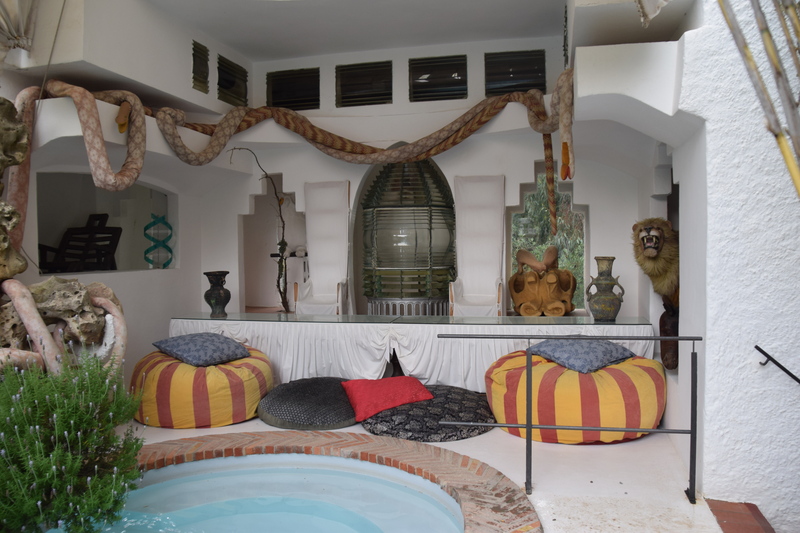 Two things did pique my interest… an oval room where, if you stand in the very centre and talk, you can’t hear anything other than your voice literally reverberating through your body (but no one else in the room can hear the echoes). I thought it was fascinating and really wanted to know how it was done – who wouldn’t want a room where you can only hear the sound of your own voice? Oh, wait, now I’m sounding weird. The second useful idea was a mirror, carefully positioned in the bedroom so that he could lie in bed and see the sunrise … I could do that at home, I thought. 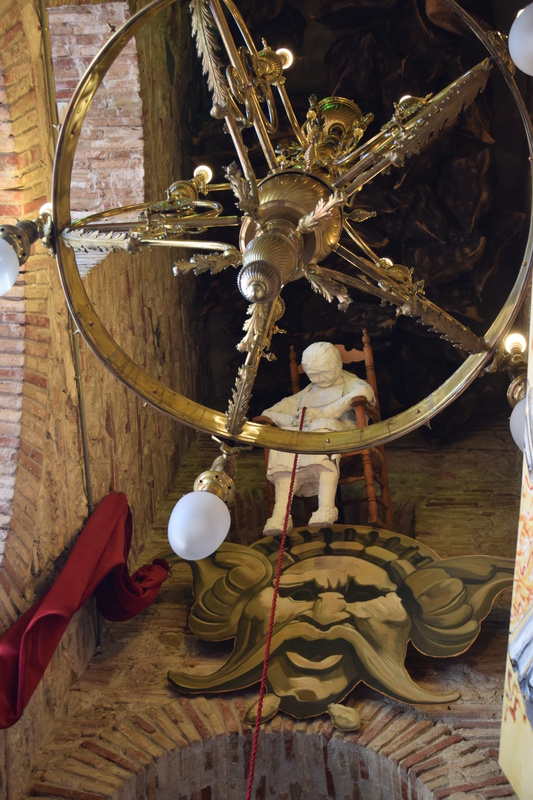 The theatre museum in Figueres – we devoted our single non-cycling day to this excursion – was slightly less weird, probably only because it wasn’t a place where people actually lived. But now that I survey the photographs, actually also pretty weird. As an artist he was prolific. 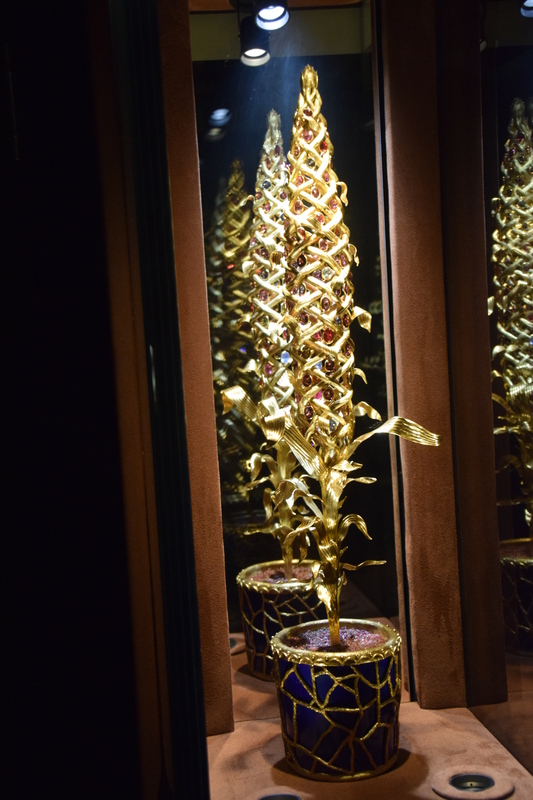 His jewels were a highlight for me – intricate pieces of precious metals and stones, perhaps a little less weird than the rest. 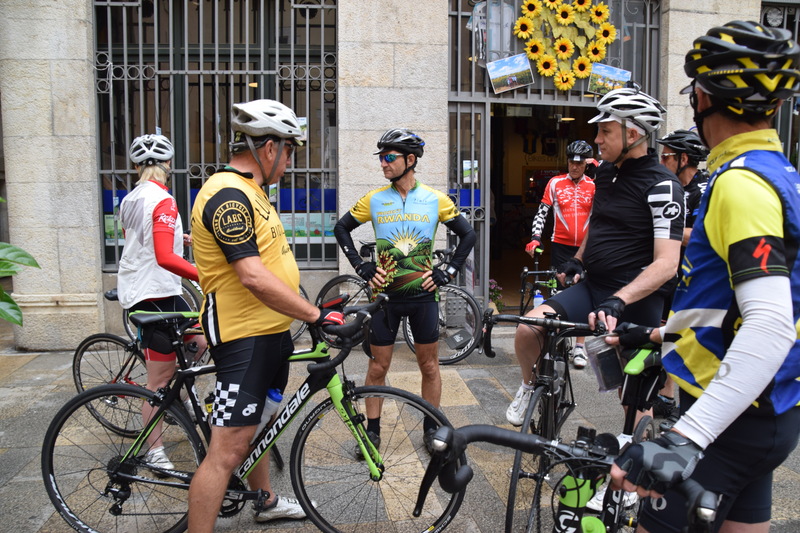 A week of vicarious enjoyment of cycling in Girona has brought with it a rich mix of expectations delivered, with a sprinkling of new discoveries. Not, let me be clear, that I am actually doing any cycling myself! As a non-cycling hanger on to this, the annual pilgrimage to one or other of the cycling meccas of Europe provides a rich opportunity to observe the subculture that, in our part of the world, is labelled MAMILs – middle aged men in Lycra. This time, we have a group of ‘grubbs’ – generally retired or unemployed biking buddies – though still very much in Lycra. The label, and the fact that for the first time, bikes have been hired here rather than transported across the world, signals a slightly more relaxed approach, compared to previous trips. Unusually, this group is lacking one of those classic alpha-males, of the must-beat-the-rest-to-the-top variety. With ages ranging across three decades, this is a group that rides together by choice. Each morning they set out, not too much later than the agreed time… though it has to be said there was quite a lot of standing around waiting for everyone to be ready to go. The small frustrations of the first morning – when everyone was collecting their bikes, sorting out the fittings, remembering to eat!, discovering water bottles not yet filled – were not thankfully repeated, as everyone got more organised, discovering, for example,that the lift to our apartment could carry two bikes at a time if packed just right. 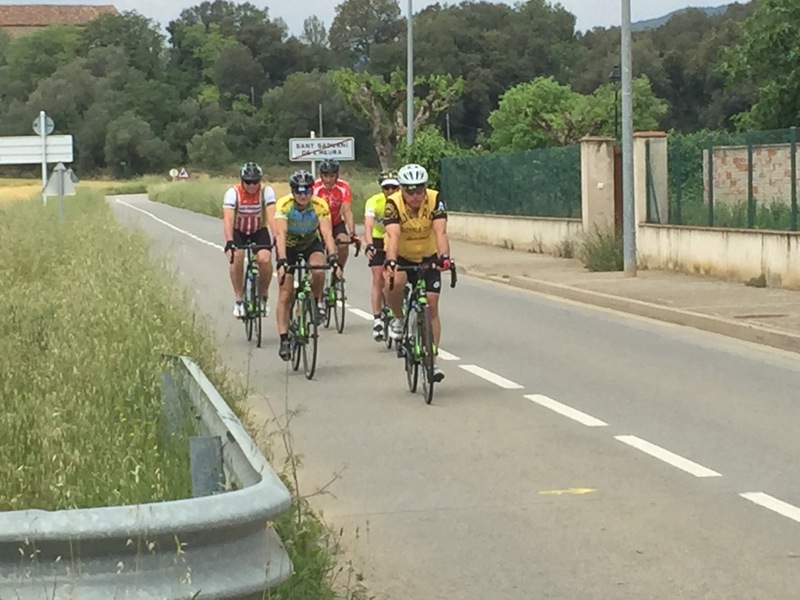 We quickly fell into a routine, settling on the next day’s ride over dinner the night before – the local bike shop a mine of information, and provider of a Garmin pre-loaded with the recommended ride for the day. Morning started with coffee – our apartment equipped with an almost barista quality coffee machine – followed by breakfast, drink bottle filling, tyre pumping and so on. Rides were varied, but generally brought the group home mid afternoon, with tales and sometimes photos of fields of wild poppies, beautiful scenery, and occasional dramas – “someone” not carrying spare tubes, or wandering off, or being unwilling to take instruction in appropriate bunch riding etiquette… Having spent a generally peaceful morning pottering about old Girona, the two non-cycling wives would find them, at one of the preferred cafes, drinking beer and eating ham and cheese toasties. 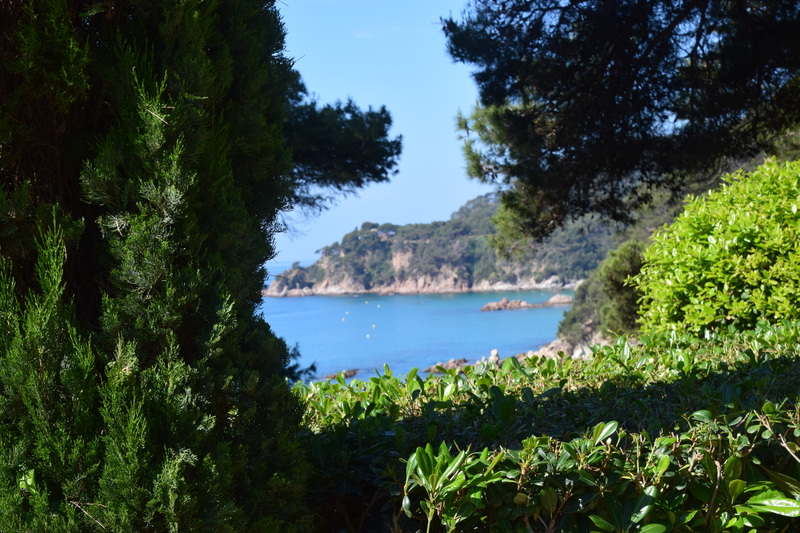 The day they road out to the coast – Tossa del Mar on the Costa Brava – I braved getting the car out and taking a drive to meet them for lunch, though it has to be said, we were a little waylaid by a spectacular garden a bit further down the coast, and arrived in Tossa to find they’d already eaten. Oh well… we looked after the bikes while they walked up to the castle to see the sights. I can report that the Mediterranean is extremely blue, extremely clear in these parts, but bloody cold! People at the beach were mainly baking themselves on what was a very stony shale-like beach. Reinforced my preference for sitting off the beach, with glass in hand, looking at the sea! Getting a group of 10 people to make a decision about dinner was perhaps our biggest challenge, made even harder by the realisation a few days in that the reason we’d only found what can only be described as pretty poor cafeteria type food was that the actual restaurants don’t open their doors until about 8.30pm. At that point I took matters (and the list of recommendations from our AirBNB host) into my own hands, and decided that we would have at least two good dinners out – more about those later. As the weekend passed the group started shrinking, with the departure of Paul & Helen on Saturday to return to London to move flats on Sunday. I headed off in the same direction on Monday morning – to a much-anticipated conference in London, leaving the group of Grubbs to fend for themselves for the final few days. I hear the tour was pronounced a success – with plenty of discussion about where to next. I heard mention of Tasmania (much closer to home) or perhaps Norway! I guess it will depend on who steps up to do the organisation – these tours don’t happen on their own! And this one will be a hard act to follow. This is my submission to the Parliamentary Health Select Committee, currently considering a petition to change the law in New Zealand to support ‘physician assisted suicide’, or, as I prefer to term it, giving people choices at the end of their lives. This is a personal story – please do not read it if you think you may be upset or offended. It is my view, and only my view, of three undignified deaths in my close family in recent years. To other family members – I truly recognise that your experiences of these deaths are different from mine, and that you may feel that these are not my stories to tell. Everyone involved has their own perspective – this is mine, respecting that you almost certainly have a different view, and irrespective of that, mostly importantly, celebrating that we all, each one of us, cared very deeply. So here is my plea to the legislators – exhorting them to lead, not follow, to a better more compassionate society. The San people – the ‘tangata whenua’ of Southern Africa – have a way of dealing with dying. A nomadic people in a harsh and unforgiving land, it is said that the final gift that the elder gives to the tribe is to sit, simply sit by the wayside, as the tribe moves on. The choosing to die – a decision made while still in control. I reflect on this, as I recount the story of these three undignified deaths, and make a heartfelt plea for a more compassionate society. “One day, you will wake up and the pain will be gone – you will only have the good memories of your Dad”. Wise words from a good friend, thank you Mark. The pain he spoke of was not, I have realised, Dad’s pain – a pain that had thankfully already passed – but the painful memories not just of having to stand by and watch Dad’s pain and indignity, but most of all the pain of being helpless to deal with my mother’s pain. Was it not enough that she had to experience the loss of her spouse of 53 years, her life’s companion? As she stood by, riddled with her own physical disabilities – unable to assist in the increasingly physical task of caring for her beloved – her distress was palpable, her feeling that she was somehow letting him down by allowing sometimes family members, sometimes complete strangers to witness his indignities. “I guess when you got on the plane (from London), you didn’t realise you were signing up for this”, Dad retaining his sense of humour as his 20-something grandson assisted in dealing with his soiled bottom, trying desperately to cause no further pain while wiping around the open wounds of bedsores and nappy-burn. Deric, my Dad, had a good life – he told me so at our last lunch. I’d persuaded him to come out with me one last time, in part to give Mum a moment alone. We went to his favourite café, ordered his favourite chicken livers – not that he could each much of them. We talked, finally, about his life. Five months earlier his doctor had given him the news – liver cancer, probably secondaries, prognosis 5 to 6 months. This was not Dad’s first brush with cancer. Nearly a decade earlier, face / mouth cancer had led to major reconstructive surgery, surgery that left him disfigured (though those around him soon stopped noticing). Then in his late 60s, he had had much to live for. The first surgeon’s advice, that nothing could be done, was firmly rejected. He was going to fight this, and he did. The wonderful team at Auckland Hospital gave him a whole new cheek, and the even bigger gift of living to see his granddaughter married, and great-granddaughter born. He adored baby Isabel with every fibre of his being, and she, now , still talks about her beloved “Dumpy”, even though he didn’t make it to her second birthday. But now in his late seventies, he was ready to go – if one is ever ready. His main concern was for my mother, who had never known what it was to live life alone. I know my story is not unique, and in fact, there are many families less-equipped than ours to deal with this. We did not have to worry about the financials of it all; we had knowledge and education on our side, and a strong network of family and friends to lean on, despite being immigrants to New Zealand. “South African by birth, Kiwi by choice” my mother has always said. How much harder must this be for families battling poverty, families unable to have an ‘equal’ conversation with doctors, families who simply don’t understand the system (or even the language)? Yet, as the oldest child, only daughter, and only child living in Auckland where my parents were, I nevertheless felt the massive weight of it all on my back. With no time to process my own grief, I grasped for the one thing that I could do that I felt would make a difference for Dad – I knew that he desperately wanted to stay at home to die. My mother, on the other hand, regularly asked when he would be going to hospital… in her paradigm, hospital is where people go to die. The idea of having a dead body in the house was just not something she could get her head around. I am eternally grateful to Hospice – for everything that they did – but particularly for enabling me to have ‘that’ conversation with Mum. I signed up for their ‘carer support’ programme – a weekly gathering focused on giving carers the practical tools – I invited Mum along, and she was not keen, but eventually agreed to go. It helped to feel like we were prepared, but most of all, it helped to talk. They also taught me to administer morphine through the injecting site that would ultimately be ‘installed’ in Dad’s shoulder as he became unable to swallow anything. Don’t be cautious, they said – anytime he appears in distress, give him another vial. I wondered if there was an unspoken message there. But sadly no, when we were truly near the end – the endless sitting around waiting for death, hoping and praying for death – I took to Dr Google, looking up whether I could, in fact, change the course by administering the full supply in one go. But no, there was simply not enough. And so, I guess, that tells you which side of the debate I am on. If I had had the provisions to administer that final dose, I would indeed have done it – not just for Dad, but for all of us. Those final 48 hours were interminable – and to my eternal regret, when I could function no longer and went home to sleep, Dad finally took his last breath, with no one at his side. “It takes time” the doctor said. “His body is shutting down, you need to give it time to do that”. But why? It’s not like we were going to start it up again, and had to make sure it was ‘properly’ shut down! Why couldn’t we just press the “off” button? Let me be clear. Dad was definitely dying. There was no treatment, no cure, just the watching and waiting. There was pain – not just for Dad (I guess, he’d say at least he had the morphine! ), but for all of us, dealing not only with our own personal pain, but with the pain of the living, those who we care deeply about. Having said his goodbyes, why was my dear Dad not allowed to simply fade into the deep goodnight, with his loved ones at his side? I have reflected on the choices he might have made in a more compassionate society. In Oregon, his doctor would have talked to him about “the prescription”. He would probably have agreed to have the drugs available – whether he would have taken them himself, I do not know. He certainly would not have taken them immediately following his diagnosis. He seems truly content to have the time to ‘get his affairs in order’, the time to talk with Mum about the choices she would make when he was gone. But the reassurance of knowing that he could end it if he wanted to, would, I believe, have made those last lucid weeks considerably less fearful. It’s about having choices – choices for everyone, the choice to take control. And yes, five years on, the pain of those days is faded, though I see it occasionally in my mother’s eyes. It comes back with force when we are again faced with the same issues, the same choices, as we have been twice since then, with the passing of my husband’s two parents. Each story is uniquely different. Each would have had its own prognosis in a world where people have a choice of dying with dignity. My husband’s mother, June, was crystal clear in her wishes. Through all my nearly 40 years of knowing her, I knew that she was pro-euthanasia. In a time where it was a mostly taboo, certainly seldom discussed topic, she managed to make it clear to all around her – not just her 3 children – that when she got the dementia (Alzheimers that runs in her family), she would, as she put it, jump off the nearest bridge. This was not a flippant comment – it was a clear plan. In the end, in one of her very last lucid moments before her brain died without having the decency to take her body along with it – she told her son that she simply didn’t have the courage to do it, that she could not bear the thought of her husband of 60 years having to find her body. As it turned out, they were both spared the pain of seeing each other die. That pain fell to the three children, all desperately devoted to doing the right thing for their two parents. Sid, their father, surprisingly went first. In one of those ridiculously trivial incidents that grew and grew, an ingrown toenail became an infected foot, that led to hospital, not once but several times. Surgery to try to improve the circulation – for without blood supply, amputation was inevitable – ultimately unsuccessful. A discharge from hospital into our home – all the while, him insisting that he was going back home to his little house in the retirement village. We knew that was never happening, but humoured him, as we set in place a roster of full time nursing care. Unlike his wife, Sid had never expressed his wishes about end of life care. Even as he was wheeled into surgery that last time, when the medical team asked if he had a non-resuscitation order in place, or what his wishes were, he pronounced that he knew his “family will make the right decision at the time”. This was, of course, not helpful – but it was his wish, that he didn’t want to think or especially to talk about end of life matters, and we respected that. So we fell into a charade – knowing that he had rejected amputation, knowing that he would ultimately die of blood poisoning, taking the decision (on his behalf) to go without antibiotics that would prolong that process… and all the while playing along with his demands to prepare for returning him to his home. His pain was real, very real – and seemingly much harder to control. His children argued about how to manage it, each, under stress, reverting to their childhood pecking-order. The oldest taking charge, the youngest feeling ignored, the middle child feeling like, well, the middle child – the daughters trying desperately to care not only for their Dad, but for each other, for their brother… their respective spouses standing at their sides, trying (and failing) to be supportive without interfering. It was long, it was horrible. Even when, finally, everyone agreed that the end was in sight and there was a space in the hospice facility, it remained seemingly impossible to relieve the poor man of his pain. United in their love of their father, the three siblings pretty much moved in to the hospice room… again, the days of waiting, the days of questioning why. As a family of dog-lovers, we have all had the sad but inevitable moment when we make the decision about that trip to the vet – the moment of standing at your faithful companion’s side, stroking his head as the vet takes away his pain forever, the relief of knowing the suffering is over. Perhaps we should have raised one of our own children to become a vet! And so finally, we buried Sid. The level of stress on family relationships at an all-time high, some just wanting it all to be over, a fitting send-off in retrospect, perhaps not fully appreciated at the time. The final argument – should June be told, should she come to the funeral? Is it right to withhold the news of her husband’s death from a loyal wife? By then, her dementia was well advanced, and so the wisdom of her wonderful carers prevailed. She never knew that Sid was gone – though from time to time, we would find her in a chair by the door, just sitting, waiting for “the man” to come visit. My husband and I travelled a few weeks later to London, where the three grandchildren who had not been able to attend the funeral, along with an assortment of friends from his past, gathered for a memorial service. Finally, away from the stress, we truly celebrated Sid’s life. Meanwhile, it seemed the June’s body would just live on and on. Always a fit person, the stress-free environment of the wonderful Awanui Rest Home (a dedicated dementia care facility) had seen her health actually improve, despite the withdrawal of supposedly necessary medications. Unlike Deric and Sid, June had signed not one, but three separate directives about her wishes, including one which was crystal clear that she did not wish to live with dementia, and that all ‘life-saving’ medication and treatments were to be withdrawn if she could no longer care for herself. Her children took her at her word, and once she was admitted into full time dementia care, somehow prevailed upon the medical people to stop all medication apart from pain relief where necessary. This included blood pressure medication that she had been taking for decades – thereby, the medical advice said, dramatically increasing her likelihood of having a major life-threatening stroke. Well, that’s exactly her intent, we said – that medication is reducing her chances of dying, it is technically therefore ‘life-saving’… difficult decisions. That was just the foretaste of difficult decisions to come. The thing about end of life decisions is that everyone has the best intentions. The family (at least in our case) wanted what was best for June, which we interpreted as honouring her very clear instructions while ensuring that she was not in pain or suffering at any stage. Her carers at Awanui moved mountains to try to keep her in their care, where we all knew she was, if not happy, at least wonderfully content. The doctors and nurses also wanted the best for her – healing of her hip (broken three times in short succession), “hospital care” which Awanui was not ‘qualified’ to offer (despite us offering to pay for full time nursing support). It is in the nature of the Alzheimers condition that change causes distress. 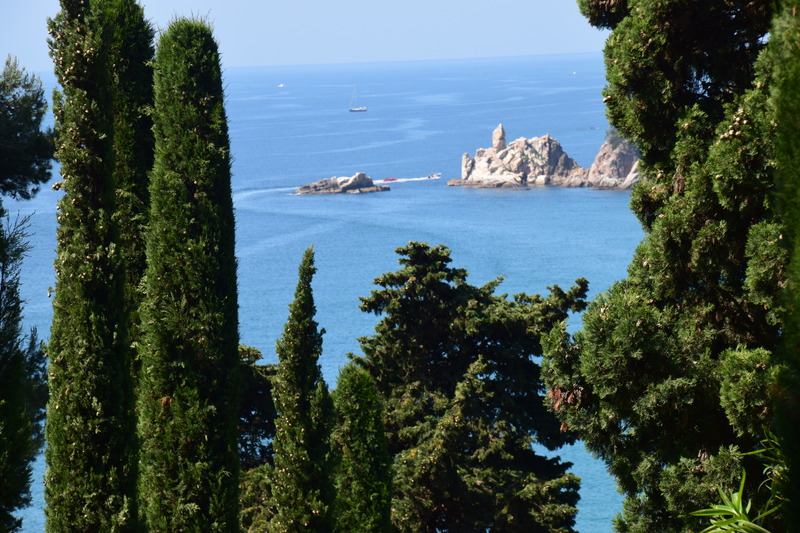 We were fortunate – in a way – that having worked for many years in a hospital setting, June felt quite at home in a large hospital ward, but transferring her to a new and foreign place would, we knew, distress her enormously. Her children dug in, at a time when they should have been supporting her and each other in their distress, they were instead trading ‘blows’ with the system, about threats of legal action to protect June’s “rights” from poor decisions made by her children. A compromise was reached – hospital care in a small ‘non-dementia-ready’ facility, who only accepted her because she was bed-ridden and therefore not bringing along all the associated ‘wandering’ behaviours of the classic dementia sufferer. In a private room, with only the television for company, June clearly decided – somewhere in the recesses of her addled brain – that enough was enough. She simply stopped eating. Who knows how much pain she endured from hunger pangs and dehydration, but ultimately, somehow against the odds, she did take back some control of her life in the end, and decided to die. It is a tribute to her three children that they supported her through this, sitting by her side. My husband said that he had already mourned her passing – his mother had died several years earlier to him, for without her wonderful brain she was no longer Mum – but nevertheless it was hard. At June’s funeral, there was one thought I could not get out of my head. We simply do not have a word in the English language that expresses the thought that surely was on the minds of most of our friends and family – yes, we are sad that your mother has passed, and yet we are just so glad for her and for you that her suffering is finally at an end, so no, we are not “sorry for your loss” at all! Perhaps, in our generation, we will invent a word for that. Through Sid and June’s dying, I stood by in admiration at the dogged determination, determination borne from true love, that their three children showed, despite their disagreements. Their solid commitment to do the right thing for each of their parents, despite the obstacles that the ‘system’ threw into their path was admirable beyond description. We should all pray that our own children show the same resolve. For June, the answer is very clear – had she been given the option for ‘assisted suicide’, had it been part of the accepted mores of our society, she would definitely have done it. Losing control of her life was the thing she feared most, and every time we reflected on her life at Awanui (incredible as the staff and the place are), we had to sadly admit that she would not have wanted to live like that. Ironically, of the three, she is the one least likely to have been helped by the proposed changes to the legislation. Dementia – possibly the biggest societal challenge posed by our aging population – is not, not technically anyway, a terminal disease. There would not have been any conversation about an assisted departure for June, despite her fervent resolve. And so we gather as a family, and we regularly talk about what’s next. How will our generation deal with these issues? How will we spare our children, and our spouses, the pain that we have endured, the pain that continues to shape our relationships with each other? Is the solution a one way first class ticket to a clinic in Switzerland, as one suggested, accompanied by the daughter we know will support the decision, with the rest of the family not knowing until it is too late? Is the solution a deliberate drive off a cliff, glass of champagne in hand? Is it stockpiling medication in the hope that enough will be available when the time comes? And more importantly, that we will not wait too long, not wait until we have forgotten what the pills are for! These are real suggestions, made by real people, real New Zealanders (well, Kiwis by choice, anyway), who have attended to the undignified dying of three parents in the past few years. Real people making their own plans, because they know that the law is not on their side. Real people, looking at places like Oregon, where the evidence shows that taking a more pragmatic, more compassionate approach to dying does not, in fact, result in a huge swarm of suicides. Rather, it gives people control, gives them choices and enables them to live out their last days with less fear of the unknown, in the knowledge that they have that control. That is all we are asking of our legislators. Compassion. Compassion to enable dying people to take control, to make their own choices. Yes, we are all dying, a little each day; but as the end becomes inexorably closer, we want the ability to choose. To choose not just how we ‘manage’ our own pain, but more importantly perhaps, to choose the time and way of our passing. To choose to have our loving family around us, without them having to endure their own journey of pain to get there – for that is the pain that does not pass. Yes, I am mostly now at a point where I remember only the good memories of my Dad. But the thing that will never pass is my own pain, the pain of my powerlessness to deal with my mother’s and brother’s pain at their helplessness. All I want is a future where we can truly celebrate that our parents, our friends, and eventually ourselves, had not only a good life, but a good death. Thank you for reading my story. This is a complicated issue, and one which I truly believe is worthy of all our efforts. It is a mark of a civilised society that we treat our elderly with respect and dignity, and a law change supporting giving people back control at the end of life will, I believe, make us a more civilised, more compassionate society. Maybe it was something in the water, maybe it was a sense of impending old age. Maybe it was the fact that we started the year with a house-full, literally, of Dwedish visitors, from about as far away as it’s possible to get from New Zealand – we loved having you here, Alex and Tea, and your Mums and other family! Or maybe it was just the plethora of too-good-to-miss opportunities that saw us feed our wanderlust to excess this year! Japan, Europe, Namibia… not quite around the world, but certainly close to it. The trip to Japan was particularly special – a long awaited opportunity for Howard to show us all what he misses about a place where he has lived and loved. And suffice to say, we fell in love with it too. Travelling in a herd of six adults and two children in strollers sounds like a daunting task, especially in a foreign culture and a country of 125million people! Not so. The Japanese people are gracious and organized. And it has to be said, just a little bit weird! I went from not actually having Japan on my ‘must see’ list, to planning our next trip. The only question is will it be for RWC2019? From one of the most populated places on earth, to one of the emptiest for sure! Our road trip from Windhoek to Cape Town – 3,500km on mostly unsealed roads – was an opportunity to truly unwind and enjoy the vast emptiness (and again resolve to return, to see the northern bits of Namibia that we missed this time around). A trip prompted by a family occasion, a 60th birthday “bash in the bush” on the banks of the glorious, game-filled Crocodile River in SA. Truly special, but a long way to go for a party, even a week-long party, so Namibia was a spur of the moment, while we are there decision, and one we were thrilled to have made. 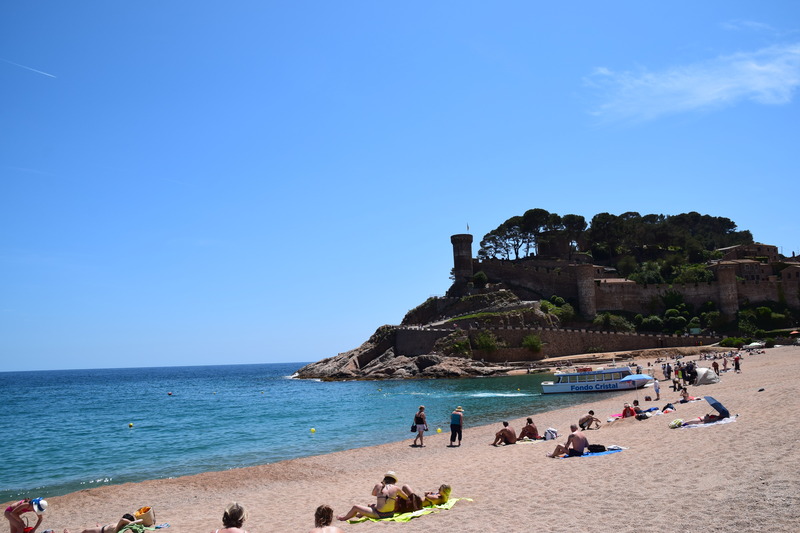 Europe was, as has become our habit, the annual cycling trip for Peter (this time a return to Argeles in the Haute Pyrenees), and an opportunity to stop in on Rob and Jenna in London. Excessive, yes. a fleeting week-long visit from Rob, home for a friend’s wedding (and a bit of Cricket World Cup!) – a very well times wedding indeed! Somehow, in between all of that, Peter managed to find time to continue building his now vast and perfectly curated music collection, while ‘looking after’ one of our growing list of start-up investee companies as the investor director, doing some consulting to the Reserve Bank, and taking on some pro-bono advocacy for another company I’m involved with, in what should have been a quick and easy negotiation, but has dragged on for almost 6 months. I’ve kept myself busy too, with a reappointment to the occupational licensing board for electrical workers, a couple of directorships and a fair bit of mentoring of young companies and their founders. I really do love the challenge of building young companies – though I have to say that changing women’s lives one bra at a time is extremely hard work! Besides bras, I am learning more each day about data analytics, property valuation and software-as-service… With a soon to be added interest in baby and children’s shoes. Plus, of course, my most important role – being Ouma to the fast-growing-up Izzy and Matthew! The downside of travelling so much is missing out on my weekly day with the grandchildren – something I’m making up for during the coming school holidays! Izzy finished Year 2 at school, and Matthew has one more year at kindy before he joins her (well, actually at the boys’ school). Izzy’s school reports talk of her unfailing enthusiasm, attacking everything with gusto, be it a reading task, a French conversation, a complicated sum (her real academic talent, I suspect) or even, amazingly the school cross country which she determinedly completed, despite only having 1 1/2 legs, and little ones at that! Matthew is a real boy… No ears, completely fearless and always hungry! Articulate and nimble, he can not only climb into the most extraordinary places, but then engage in a debate about why he should or should not be up there! Be it sitting in the upper story window with legs dangling out – “I’m just sitting” – or setting off for a “walk” across the top of the pergola over our front path… Suffice to say, this is the child that Philippa always deserved! Family remains the most important thing in our lives. Our great sadness this year was to see June, Peter’s Mum, deteriorating after a number of falls. Finally, in October, she seemed to decide that enough was enough, and passed away peacefully after what has been, for all the family, a truly anguished battle with Alzheimers. Such a cruel disease. She would have been so proud of Peter, Lindsay and Anne – battling for her rights, and her comfort, to the very last. As Isabel observed, she’s now down to just one ‘great-grand’parent (having had – and known 5 when she was born!). My mother (Nanna) just keeps on keeping on, despite many ailments which seem to limit her mobility more each week. Despite her ever-present pain, she remains mostly positive, and still enjoys her craft groups, her friends, and especially having the children at her place regularly, playing board games with Matthew and teaching Isabel a vast array of arts and crafts. She remains generous beyond reason, always true to the adage that it is better to give than receive – a truly good person. Waifs and strays dinners – a gathering of the younger generation of the family, and assorted others who happen to be in Auckland – has continued at our place most Monday evenings. Sometimes a low key affair, sometimes a hotbed of debate and shouting… food quality variable, company almost always good, an opportunity for Philippa and her cousins to keep in touch with each others’ lives, and with the lives of the rest who are now scattered to the four winds. We miss you Rob, Catherine, Jess and James! As we gather this year, we will remember those missing from our table, those who have passed, those who have settled afar, those who we hope will one day come home and those who are just travelling on various adventures. More importantly, we will celebrate that wherever we and they are in the world, from country to country, from generation to generation, family is family. We may be crazy, we may not always agree, but we know for sure that we are here for each other – and that’s why we gather with those who are here to celebrate!